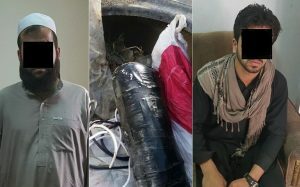 At least two people were arrested for being involved in magnetic bombings in Kabul city amid a steep rise in such bombings in the city. The officials in the Criminal Investigation Department of the Ministry of interior said the two men were arrested earlier this week. The officials further added that the two men were serving in a mosque as prayer leaders and were in the meantime involved in magnetic bombings. According to the CID officials, the two men had recently planted a magnetic bomb in a residential house in the vicinity of the 10th police district of the city. The suspects were arrested after the police forces were informed regarding the threats being issued to the residents of the house and the magnetic bomb was planted in their garage, the officials said. They also added that the two men are in custody of the security forces for further investigations and it is yet not clear to which group the two men belong to. This comes as there has been a steep rise in magnetic bombings in Kabul city and other key areas of the country during the recent months. At least three people were wounded in a similar attack late on Sunday after a magnetic bomb planted in their vehicle went off in Deh Afghanan area of the city.